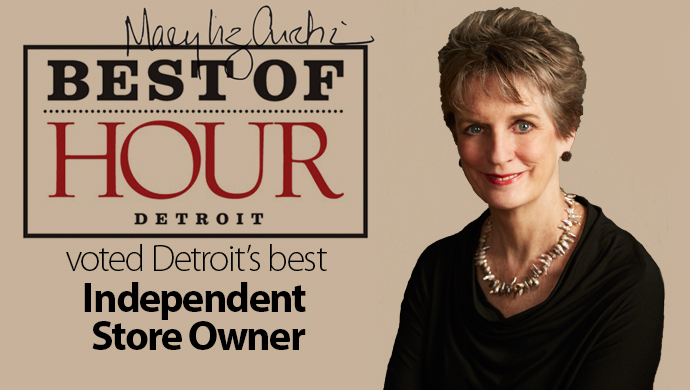 May 29, 2013 (Clawson, MI) – Mary Liz Curtin, co-owner of Leon & Lulu, a destination lifestyle store in Clawson, Mich.,was voted best Independent Store Owner by readers of Hour Detroit magazine in its 2013 Best of Detroit contest. Hour Detroit, a popular Michigan monthly magazine, asks its upscale readers to vote for their favorite local businesses, personalities, athletes, philanthropists, media outlets, restaurants and more on ballots placed inside the March issue of the magazine and on its website. Results of the popular yearly contest were revealed in the June issue of the magazine where Curtin was named along with 257 other winners among 100 categories. “What a thrill and a great surprise to win this very special honor,” says Mary Liz Curtin, co-owner of Leon & Lulu. “Hour Detroit is a very prestigious publication and I am beyond grateful the fans of Leon & Lulu, staff, friends and clients took the time to vote and think of me. It’s been a very lucky seventh year in business for us,” says Curtin. Leon & Lulu has nabbed several awards this year, including The Next Big Give put on by the Dallas Market Center, which recognizes specialty retailers that make a difference in their communities. The store also won Best Furniture Store and Best Unique Shop in the Daily Tribune’s 2013 readers poll, and Best Place to Find Home Décor Real Detroit Weekly’s 2013 Best of Detroit contest. In April Curtin also was invited by The Wall Street Journal to be a small business contributor to The Experts, an exciting new online forum at The Wall Street Journal. The Experts is designed to give readers a deeper understanding of small business issues as they are covered in The Journal Reports, one of the paper’s most popular sections. Several outside contributors—all entrepreneurs, academics and owners of successful, independent businesses—chime in on agenda-setting small business issues as they are covered in Reports. Curtin and the others interact with readers though short blog posts and video interviews about once every six weeks. It’s been less than a year, too, since Mary Liz Curtin received the ICON Honor for individual career accomplishment. Created exclusively by Americas Mart Atlanta in partnership with GHTA and HFN, ICON Honors is the first international program fully embracing the gift and home categories in an independent recognition of exemplary achievement across the industry for product manufacturing, product sales representative businesses and retailing. Winners of Hour Detroit’s Best of Detroit contest will be celebrated at a party June 21 at Motor City Casino Hotel in Detroit. For more information onLeon & Lulu, please visit www.leonandlulu.com. To learn more aboutHour Detroit’s Best of Detroit party, visit www.hourdetroit.com. About Leon & Lulu: A destination lifestyle store featuring an eclectic mix of upscale furniture, unforgettable gifts, and accessories in an environment unlike any other. Located in the historic Ambassador Roller Rink in Clawson, Michigan, Leon & Lulu offers 15,000-square feet of fabulous shopping, with a new 7,800-square feet expansion into the neighboring Old Clawson Theatre slated to open this spring. Locally owned and family run, Leon & Lulu prides itself in providing a fun, welcoming atmosphere, serving hot coffee, cookies and popcorn – often via roller skates – to visiting patrons. For more information, or to shop online, please visit www.leonandlulu.com.